This is something that Stephanie and I have been meaning to go to-- to see the houses that are not ours in spectacular states of repair, and lust after all those things in a historic home that we can't possibly afford, in a neighborhood that is less than a half mile from ours in geography, but miles away in stature, safety, and general feelings of ease. Seriously, I think it will be a lot of fun (and our friends Mark and Beth, who have a fabulous house in Park Hill of their own) will be shepherding the music (at the Park Hill Racquet Club, which will also have a variety of tasty delicacies available for sale.) The Music is part of their project that they've got going on, Musician's Anonymous. Tickets are $20 at the Host Area. 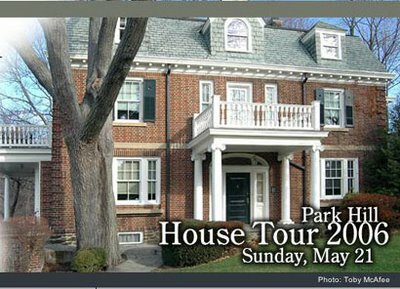 Comments on "Park Hill House Tour -Sunday May 21"